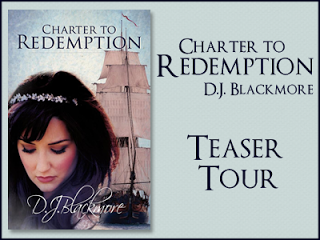 I'm excited to host a teaser tour stop for Charter to Redemption by D.J. Blackmore. Publication: May 1st 2014 by Even Before Publishing. At the close of 1821, the penal colony of Newcastle looks to be every bit as black as it's painted. Emma Colchester charters a ride to Australia with a promise of marriage to a man she has never met. But appearances aren't always as they seem. And with a commitment unavoidable Emma learns that shackles are not always forged from iron. Tobias Freeman longs for redemption and hope. After a rough journey to New South Wales, Tobias learns the rations, the regulations, and the reprisal. But neither Emma nor Tobias expect the repercussions. Britain’s penal colony of Newcastle is as cruel as it is beautiful. With a pledge to marry a man she has never met, Emma sons learns that appearance can deceive, and that shackles are not always forged in iron. Tobias Freeman is anything but what his name suggests. As a convict awaiting ‘his majesty’s pleasure’, he realises he has no rights, especially concerning Emma Colchester. When the unexpected happens, neither Emma nor Tobias bargain on the repercussions. The man she thought was the commandant led her down the garden path and clicked shut the white picket gate behind them. Emma glanced up hesitantly and her hand shot to her mouth to still her gasp of surprise. ‘What are you doing wearing his clothes?’ Emma whispered as she glanced back at the manse. Laughter tinkled through the open windows like silverware on china. Emma felt herself colour deeply at the audacious compliment. She looked up in sudden breathless nervousness. Emma saw his eyes glitter and the butterflies in her stomach fluttered madly at the consequences of being in the company of a convict; both for her and him. The convict swept her a gracious bow and displayed a military bearing that looked as though it had been born to him. ‘I heard enough in the garden to know you were destined as the sweets course, that’s for sure.’ Emma frowned at the coarse insinuation. ‘I beg your pardon, miss. I never realised I was staring.’ They stood silent for a moment. ‘Can you waltz?’ the convict asked. ‘That I am,’ he said with a bow from the waist. Emma took the hand held out to her, but glanced away from the parsonage, away from Gideon Quinn who stood at the open door. She could not see his features, but she could make out the indecision in his stance. Would he cut in on her dancing partner in displeasure? Yet he mustn’t have seen the commandant as a rival,because after a moment’s thought he retreated. Emma had feared he would surely see through this man’s disguise.As the strain of the single violin reached them, he took her in his arms and began to sway in time to the music. Emma noted that the convict’s movements were both strong and fluid. ‘I will say nothing against you,’ she said. ‘What you are doing is folly, to say the least.’ She said. He didn’t justify his actions, so Emma continued. ‘Aye, I do.’ For the first time Emma saw him smile. She was surprised to see that his teeth were strong and white, even as she wondered at his apparent unconcern. D. J. Blackmore is a Hunter Valley, New South Wales author, born and raised. 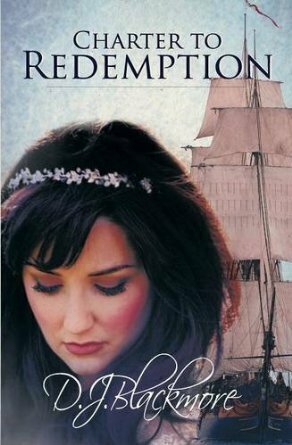 Her convict heritage and love of history have seen the author explore this in 'Charter to Redemption.' Yet is is perhaps Australian dogged determination has seen this debut author as a new name in fiction. Although amazon reviews reflect her work, it is pertinent to note that the author's story is not unique, although her journey in writing has been. Numerous rejections never daunted the author, and many years after her dream was envisaged, so was the reality. Yet for all the countless doubts that niggle every writer who has lived in hope, it is humbling praise indeed when reviewer F. Stanford writes of 'Charter to Redemption' and Ms Blackmore's work: "this could very well be the benchmark for the standard of modern-day classics." Thank you so much for posting! I liked the teaser and I am looking forward to reading this.